Never had one heard of any military in the world stooping so low as to indulge in stone-pelting. But Chinese troops did just that in Ladakh coinciding with India's Independence Day, August 15,2017, indicating the whole world to what extent the Communist Party of China (CPC) is ridden with chronic jaundice, not to talk of President Xi Jinping's frustration over the standoff at Doklam. It is normal for Chinese officials lying that are not aware of the incident but that is impossible with CPC's political commisars keeping a hawk eye down to the sub-unit level. The border divisions of China are directly under the PLA and President Xi Jinping is the Commander-in-Chief besides heading the Central Military Commission. The Indian troops naturally retaliated to the stone pelting by the PLA in similar measure. 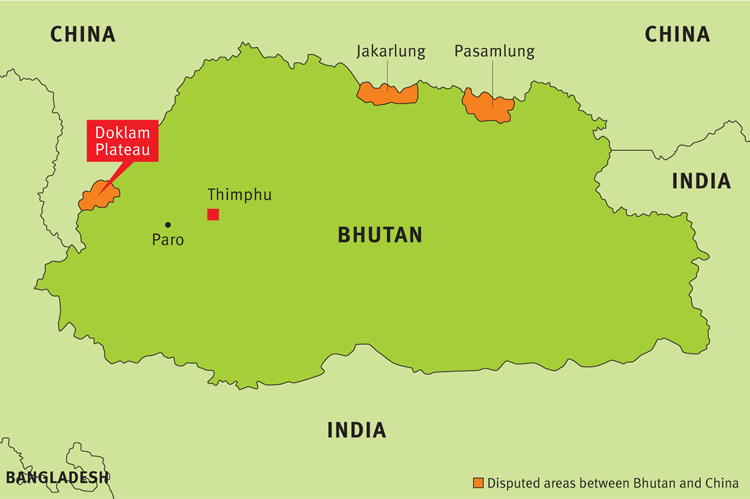 The confrontation reportedly took place on the north bank of the Pangong Tso in eastern Ladakh, two-thirds of which is controlled by the Chinese in occupation of Tibet. Media reports, quoting a source, say, "There was a scuffle between the two sides, which included some stone-pelting as well, after Indian soldiers blocked two attempts by PLA troops to enter Indian Territory at the Finger-4 and Finger-5 areas early in the morning. Personnel from both sides received some injuries in the stone-pelting. The rival troops later pulled back from the confrontation site after banner drills to defuse the situation." The spurs of the mountains forming the northern bank of Pangong Tso are termed as 'fingers'. On a west-to-east axis, Indian Territory is till 'Finger 8', but is in physical control till 'Finger 4'. The aerial distance between the two 'fingers' is about 15 km. The land north of these mountains is disputed. Land patrols of both sides often come face to face and a drill is followed to disengage. This includes unfurling of a banner, asking each other to withdraw. The stone pelting by PLA troops is unprecedented. In late July, PLA soldiers had transgressed twice astride the LAC at Barahoti in the Chamoli District of Uttarakhand. There were also reports of PLA helicopters transgressing. China that thought it can quietly intrude and occupy the Doklam Plateau in Bhutan was obviously taken by surprise when India came to the assistance of Bhutan to block the invading Chinese soldiers. PLA is now reportedly making bunkers in the area and China continues to refuse the only possible and respectable solution of mutual and simultaneous withdrawal. The standoff has become a prestige issue for the CPC that has surrounded itself with a false aura of invincibility while Xi Jinping is in a similar situation with the coterie surrounding him baying for conflict, and he himself having accumulated total power unto himself. The fact is that the Doklam standoff has become major embarrassment for China. But Jinping has another major worry – the raging feud within the CPC; Jiang Zemin-led Shanghai faction and Hu Jintao-led Beijing faction are reportedly engaged in covert war with the Xi-Jinping-led Zhenjiang faction. This is the reason China has not been able to announce dates for the 19th National Congress of the CPC beyond saying it will be held this autumn. As the 'Core Leader' of China, Jinping desperately needs to divert attention not only from these factional clashes within the CPC but also mounting unemployment and protests. Jinping is also alarmed about the US-North Korea flash point in Western Pacific. Much that China would want North Korea to strike US assets and US allies, the timing does not suit China while consistently pursuing militarization of the South China Sea despite denials. Hopefully better sense will prevail and China will heed the sane voices within China that confrontation and conflict will only harm China's economic interests not only in India but elsewhere. China's naked aggression to a peaceful neighbour like Bhutan is being watched globally, which is likely to have a ripple effect on how smooth or rough China's One Belt One Road (OBOR) initiative and the Maritime Silk Route (MSR) may flow. History shows that Hitler's glory too was short-lived. Besides, this is the 21st Century where conventional conflict is hardly the preferred norm. China should realize that muscling through the China Dream without sense and sensibility will likely have comebacks that may not be good for future sustenance of China.